We had awesome weather today in Lübeck. I did hike the last days and today it was so hot in my apartment that I had to get out there too. I have the issue that my living room is on the sunny side and it can get unbearable warm in the room. I didn’t want to go hiking again, instead I called a friend and asked him if he would like to drink one or two beers somewhere at the Trave River. We met each other and went to the Holsten Gate to sit at the mentioned river that flows also behind the gate. It was so hot, but it’s definitely more bearable at the river. It was especially tolerable because we bought two cold Curuba beers. We talked about this and that and enjoyed the weather. From time to time we walked further, because the river around the historic district has different beautiful sides. Later we decided to purchase one more beer but that is usually difficult on a Sunday because most shops are closed. We found a snack bar and asked for an Alster Beer (shandy beer) but they didn’t have one. No problem, we purchased a beer and a Fanta soda bottle, because if you mix them both, you get a soft Alster beer and it’s very delicious. 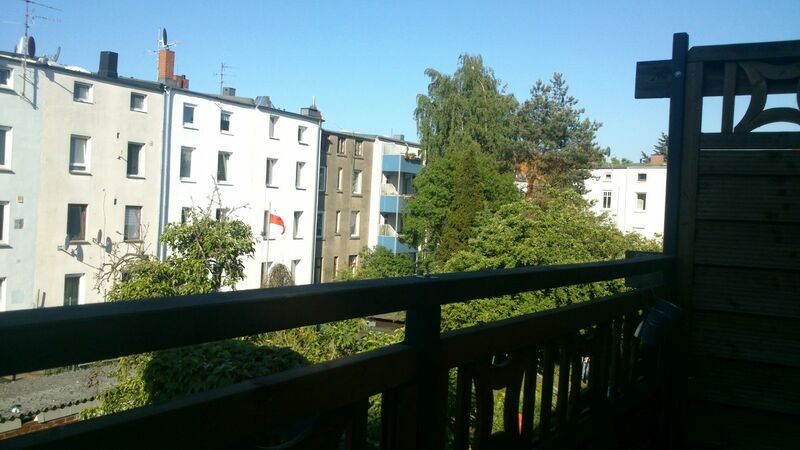 We went to the district where my friend lives and sat on his balcony. It’s funny, the view from his balcony is quit shady because all the buildings are quite old, but on the other side it is appealing for the exact same reason. In the afternoon, he has a lot of shadow on the balcony, that’s great when there is so much sun. Our mixed beer was super delicious too. Summer feeling came up today, because it was nice to spend time with a friend in the city. my Son commutes to Germany on a regular basis, mostly Stuttgart and Munich. he LOVES it there! he has amazing photos (a hobby can pursue while working) I hope someday I can go along to visit your country! he is on Instagram… ben_in_sf You will love his photography! Awesome. Found it…. I will check his photos out! I knew you would! how could you not? Sounds like a good way to spend Sunday Dennis. I am a bit surprised that the shops are mostly closed though, is that the case throughout Germany or just the particular area where you were that day? When you live here, you calculate Sundays in when you plan your shopping, otherwise it’s a good day to enjoy some things from the delicious snack bars in and around the city 🙂 I usually take care that I have drinks or water at home because grocery stores are much cheaper, but I like to eat outside on Sundays… as yesterday, where I bought a kebab too. That is interesting. It was more or less like that when I was young but then shopping hours were deregulated and now most shops are open every day. Small businesses often find this unecomomic and don’t open so the big supermarkets etc monopolise the market. Of course I’m talking about the city and suburbs here. In the country more stores will be closed on Sunday unless t hey are tourist oriented. We have a local independent supermarket which is open every day but it is a little dearer to shop there. On the other hand the chain store is 20kms away so you don’t save much driving there and back. On the other hand we can’t buy beer at the gas station. Liquor stores are open most days though. It is pretty hard on retail workers who are expected to work all hours and now they are to have their penalty rates cut so it’s not worth it financially but most have to do it because they are casual workers and take what they can get. Yeah, I think this is one of those topic where I as a customer would love it to go shopping on Sundays, but from a different perspective it’s good that this isn’t the case and grocery workers have their free day. I believe (but I am not completely sure anymore) as kid even the Saturday was regulated. Also back then, I barely heard of people that worked on Saturdays, except hospital staff or alike. I think working on Saturdays and Sundays just became a thing later. But with the Deutsche Mark one person earnes that much that he could feed a whole family. Today womans do work fulltime too, that was very uncommon in our family too back then apart from part-time jobs maybe. I have to add, the “Ladenschluss Gesetz” did count throughout Germany. I think a few years ago the decision was handed over to the individual states within Germany but I guess it doesn’t vary too much in different states… I could imagine that each state made a few adjustments but I have not heard about a state where all shops can open on Sundays. I think you can generalize and say in Germany most shops are closed on Sundays, and can’t open before 6 am during the other days and have to close around 22 pm at the latest, again with some exceptions here and there (gas stations are opened 24/7 for example). I do also know one grocery store that closes 4 hours later than all others, maybe they use a loophole that is caused by some of the exceptions. It is convenient to have Sunday shopping if you work during the week and can’t shop at other times . However, I do quite like the concept of giving consideration to the workers. I think it does vary from state to state here too. Yes, it’s one of those topics where you stand between two chairs. It’s good for the one side, bad for the other 🙂 Also, as mentioned in my other comment… you made a good point. Germany does also have some highly frequented tourist hotspots where there are more exceptions and where stores do open at uncommon times.